When first published in 1945, Françoise Frenkel’s wartime memoir, Rien où poser sa tête, received just one review. The brief piece appeared in the Franco-Swiss feminist journal Le Mouvement féministe, noting with muted praise Frenkel’s “decency” and “lively” delivery. But, when read today, it is the critic’s quasi-prophetic concluding line that stands out most: “Françoise Frenkel ne serait-elles pas une des «héroïnes inconnues»?” (“Is Françoise Frenkel not one of our unsung heroines?”) The reviewer here anticipates, albeit accidentally, the book’s fate for the rest of the century. With its Swiss publisher defunct, the book went out of circulation and of public consciousness for over fifty years. But, in a twist of its projected destiny, Frenkel’s memoir was rediscovered in 2010 in a bric-à-brac sale in Nice, France, and republished to widespread acclaim in its original French. And in 2018, for the first time, the “héroïne inconnue” is brought to Anglophone audiences thanks to translator Stephanie Smee, whose English version No Place to Lay One’s Head is published this year by Pushkin Press. Who was the memoir’s unknown heroine, whose name is only now beginning to reach international audiences? Frymeta Idesa Frenkel, known as Françoise, was born in 1899 in Poland to a Jewish family. Frenkel spent her formative years in Paris studying the arts at the Sorbonne, nurturing a passion for French culture that would endure throughout her life. Committed from childhood to a career as a bookseller, Frenkel resisted the warnings of cautious peers to establish Berlin’s first French-language bookshop, La Maison du Livre, in 1921, which she refers to as her “raison d’être.” But while the bookshop enjoyed early success, the darkening political climate and mounting violence of the thirties forced Frenkel to flee the city. Narrowly surviving the horrors of Kristallnacht, she left Berlin in 1939, spending nine months in Paris before embarking upon a journey south to Nice as the Occupation took hold. Surviving several periods in hiding, Frenkel’s transit ends following her escape into Switzerland, where she lived until her death in 1975, though little detail remains of the life she led following the War. 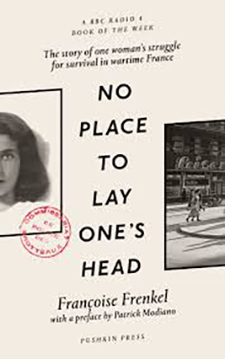 No Place to Lay One’s Head looks back over Frenkel’s life, from her youth as a bibliophile and her establishment of the bookstore in Berlin, to her journey across France and a final passage into Switzerland. Frenkel presents a story of survival and resilience dedicated in her foreword to the memory of the “MEN AND WOMEN OF GOOD WILL” who, with great courage and often at considerable risk to their own lives, helped and inspired her along the journey. Translator Stephanie Smee’s first encounter with Frenkel’s text was something of an accident. “I first came across Frenkel’s memoir after seeing a review of it in Lire magazine. I had the good fortune to be in Paris when I read it for the first time, and many of the images she described, particularly of her early years in Paris, felt incredibly poignant,” she writes, in an email exchange earlier this year. Soon after, Smee contacted the memoir’s French publishers, Gallimard, to discuss securing the rights, supported by Penguin Random House Australia where her translation was first published. When asked what she considers a good translation, Smee notes: “I think the short point is: we know it when we read it.” Likening the task of translating to that of describing a scent or a perfume, Smee remarks: “Sometimes you have the almost sensory experience that you recognise the ‘scent,’ that is, the meaning, and understand what the author is trying to say. [ . . . ] You then have to try to describe the scent accurately, [ . . . ] in much the same way a scent will enhance one’s impression of a room or a place.” And she notes, too, a desire for translations to retain a sense of the text’s “otherness”: hers is a preference for work that, whilst seamlessly and accurately rendered in translated form, “reminds you of its origins.” Frenkel’s linguistic “origins” and influences are multiple: although she wrote in French, it was her second language, and one of at least three she spoke fluently. Rendering the work of this multilingual and widely read author into English is therefore no small undertaking. Stripped of excess and value judgements, such passages read with the factual precision and minimal mediation to which a reporter aspires. Frenkel displays balance and empathy in characterising even some of the cruellest figures she encounters along her journey, often searching for redeeming qualities amidst the abhorrent, and investing her energies into understanding their motives rather than lamenting their brutality. And, at points, Frenkel turns her observational neutrality inward, leaving the reader to do the work of processing the horror of her circumstances. One near-fatal scene on a train near Grenoble is especially illustrative. Frenkel sits in a carriage with false papers, observing an inspection of a fellow passenger who narrowly survives the encounter, and all the while fearful that she may be found out. She concludes the whole scene, and chapter, with the simple line: “It is not hard to imagine my own emotions during this exchange” (177). Smee’s translation renders many such passages to great effect, particularly in her well-researched use of period terminology and vernacular dialogue. Nevertheless, where Frenkel moves into a register befitting of reportage the translation displays some unfortunate “Frenchisms.” For my taste, cognate words such as “promenade” would be better rendered as “walk,” while the occasional use of French phrasing and syntax in English feels less like an opportunity for Smee to convey the text’s “otherness” than an editorial oversight that could have been smoothened out with closer revision. Perhaps most uncomfortably, the heading of chapter one, in which Frenkel relates the story of how the bookshop was established, “Au Service de la Pensée Française en Allemagne” (“In Service to French Thought in Germany”), is translated into English as “A French Bookshop in Berlin.” Why this decision to dampen the gravity with which Frenkel viewed her undertaking? Maybe it was felt that the remainder of the chapter illustrates this clearly enough (Smee’s later choice of “crusade” for the French “mission” has depth and impact, for example). But in a climate where so many thinkers, and their books, burned for their commitment to “la pensée,” neutralising Frenkel’s sense of political and cultural duty here feels like a misrepresentation, and a significant loss. It is when the memoir moves into a more lyrical register that Smee really finds her voice. Frenkel’s deftness with imagery and strong eye for the symbolism of the everyday all contribute to the book’s literary, as well as journalistic, distinction, and Smee’s translation negotiates her figurative, rhythmic language with impressive agility. The interest in Frenkel’s timely memoir, including by Nobel laureate Patrick Modiano, who contributes a preface to the book, seems unsurprising. The mystery of Frenkel’s real-life story, and the chance reappearance of the memoir, read uncannily like the plot of one of Modiano’s own novellas (recalling particularly the “héroïne inconnue” of his 1997 work, Dora Bruder). And, like Modiano, whose writing often reaches back into the French literary canon to draw on nineteenth-century writers including Baudelaire and Balzac, there is strong evidence of Frenkel’s own passion for the French classics. In an altercation with an official who rejects her application for a Swiss entry visa because “[w]e have a new France now. The masters you served no longer exist,” Frenkel curtly retorts: “Boileau, Molière, Corneille, Racine, Voltaire . . . these are the masters I have served, Monsieur, these and many other of your immortal countrymen!” (123). Frenkel’s work at times displays a playwright’s capacity for structure, dramatic irony, and pace. At points, too, the highly formal register seems to bear the hallmarks of a life spent reading neoclassical tragedy. Smee is especially adept in conveying this in English, seen, for example, in her rendering of the dramatic exhortations of Frenkel’s foreword: “May these pages inspire a reverent thought for those forever silenced, fallen by the wayside or murdered,” and “Dear reader, accord them the grateful affection deserved by all such magnanimous acts!” (17). Retaining the exclamation marks, more common to literary French than English, seems an appropriate means by which to sustain Frenkel’s insistent tone, and—in this instance—a justified nod to the “otherness” of Frenkel’s original French. For Smee, the process of working on the book enabled her to reflect on Frenkel’s extraordinary life with privileged intimacy. She remarks: “Translating Frenkel’s memoir has certainly enhanced my ability to empathise with her, and the millions of other souls who suffered so appallingly.” Publishing trends since the nineties in France and beyond suggest a desire among contemporary readers to dig deeper into established narratives of the Vichy period and its aftermath, unearthing the alternative stories that have yet to be told: Anne Sebba’s Les Parisiennes: How the Women of Paris Lived, Loved and Died in the 1940s and the forthcoming Left Bank: Art, Passion and the Rebirth of Paris 1940–1950 by Agnès Poirier are just two such examples. And, of course, the violence induced by recent divisive politics and the rhetoric of xenophobia, along with the maltreatment of refugees across the world, bear disquieting parallels with the political climate Frenkel’s memoir so evocatively details. As Smee comments in her interview: “We cannot hope to understand and empathise with the circumstances of our fellow humans who continue to suffer persecution and deprivation in so many countries if we cannot understand their stories. These stories need to continue to be told, to be heard, to be translated and distributed.” I’d concur. Albeit by chance, the “héroïne inconnue” of No Place to Lay One’s Head has resurfaced at a time when it seems audiences are most in need of her voice. Brigette Manion is a reviewer based in London. Her writing on art, books, and film has appeared in publications including the Financial Times, the Brixton Review of Books, Ceramic Review, and more.